[A] [(V)]: At the start of your Main Phase, Soulcharge: (1), and this gains +2000 Power for the turn. 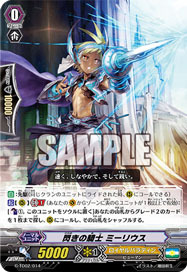 [S] [(V)]: [Soulblast: (8), Counterblast: (5)] For the rest of the game, this gains +1 Critical and "[C] [(V)]: For each ::Gold Paladin:: Rearguard you have, this gains +1000 Power". I shall return it one trillion times! Eat this, Vendetta Berserk!